Zucchini bread and butter with tumeric, onions, celery seeds, and yellow mustard seeds. I ran out of apple cider vinegar and supplemented with white wine. The zucchini and onion slices were salted before boiling in vinegar for 5 minutes. 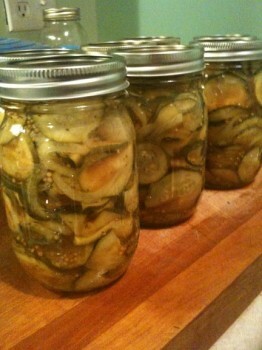 I think I’m going to have to have a pickle party this winter! Thursday, September 9th, 2010 at 7:11 AM	| Filed under Uncategorized	| Follow responses Both comments and pings are closed.